Traffic lights that tell drivers what speed they need to travel at in order to reach the next set of lights when they're green are to be trialled in the UK. The lights aim to cut down on stop-start congestion and, in doing so, reduce vehicle emissions. They will be tested using a simulation model of the A59 in York. The technology, developed by engineering firm AECOM, is one of five concepts shortlisted in a competition launched by Highways England, the National Infrastructure Commission and Innovate UK to design roads for autonomous vehicles. NIC chairman Sir John Armitt said, "We can see for ourselves the progress in developing cars for the future, with trials of driverless cars taking place across the country," he said. "We now need to make sure the technology on our roads keeps up." The move follows last year's announcement that smart traffic lights would be installed in Milton Keynes. The city is investing £3 million, with the help of Innovate UK and Tracsis, into the tech - which is scheduled to be installed in September 2018. 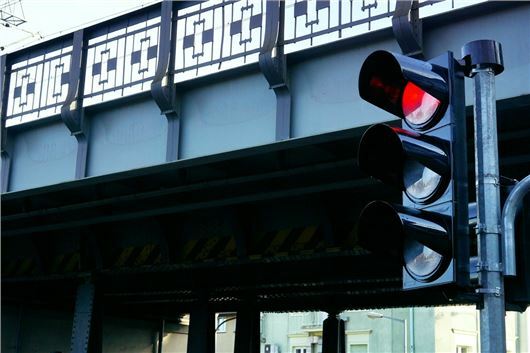 Vivacity Labs, the company that developed the technology, will install 2500 AI-powered cameras into the lights to monitor traffic around the city. This will allow urban roads to be monitored and managed more appropriately by what the traffic situation is like at the time. The sensors will cover 50 square miles, and oversee all major junctions and car parks. They will help traffic lights prioritise ambulances, buses and cyclists and ease the flow of traffic to prevent congestion. Been in use in Germany for years in a less technical form, as you approached the lights a warning light before the main lights would have a speed displayed, as long as you were doing the speed displayed when you drove past the warning light, you would get through the traffic lights. If the warning light turned to flashing amber before you got to it you had to stop at the lights. Simples. How many times have I read stories like that over the past 20 years? This will never go into production. Local authorities in the UK add lights to deliberately create congestion as part of their anti-car agenda. Open your eyes my friend, he/she's spot on. B****r the technology , lets just have surfaces fit to drive on! They've had 'Linked Lights' in Slough for over 40 years, they worked brilliantly. I can remember a "trial" like this in the early seventies on the A4 past Slough trading estate, if you kept to 30 all the lights were green when you got to them, so whats new ?? I think the money would be best spent on improving the road surfaces to get rid of the thousands of potholes. That would be more sensible. Brilliant improvement, although its not new. But can we sort out the speed humps that are so high and unregulated that they wreck cars. So, they'll priorities cycles? What a waste of time, how often do cyclists stop at a red light anyway? Worked superbly in Koln in 1968 ; what have we been doing for the past 50 years?! Why on earth prioritise cyclists? They have no insurance, they don't have to pass a test, learn the rules of the road or hghway code, they don't even have to pass medical requirements or even have an eye test, have no MOT to ensure their vehicle is safe and don't have a number plate so they can be tracked down when they cause an accident and most of all they pay NOTHING towards the road so why waste money on them or prioritise them over people who pay through the nose for our roads? Because it's an easy way to make life more awkward for car drivers of course! Tinkering with traffic light sequences is not new. Ken Livingstone did it in London to make driving through less convenient. The difference here is the smart technology. Where it worked years ago I would suggest is coincidence rather than intentional. These smart traffic lights were in use in Belgium in 1967 and probably earlier. They saved a huge amount of time if you were prepared to drive at the speed they said, you never had to stop at a traffic light! This system was in use in Israel too over 30 years ago. Worked like a charm. I lived there in the seventies and eighties and the Germans had them then and they worked very well. Luegallee Düsseldorf as well as several other locations in the city had this in 1970. It was called Grüne Welle, Green Wave, and it worked really well. All the comments below about similar systems being used abroad for years - so why has it taken so long to get here? Anyway, certainly in the Labour-controlled North they won't be used / won't help because all the local councils are hell-bent on making live WORSE for motorists, not better.